Snow Goose hunting from north central Kansas to all of north and south west Missouri. 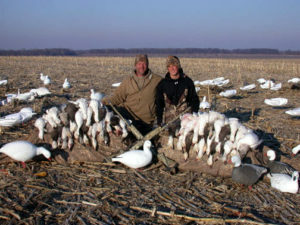 One example of a three day snow goose hunt. First day scout by driving and glassing where the snow geese are working. Concentrations will be evident around the larger refuges. Put out field set near by that afternoon. The morning of the second day call/decoy to field set. Third morning call/decoy again. Pull decoys and head home. Good scouting will yield the location to place a field set quickly enough. Two morning hunt with good call/decoy will yield plenty for the freezer. 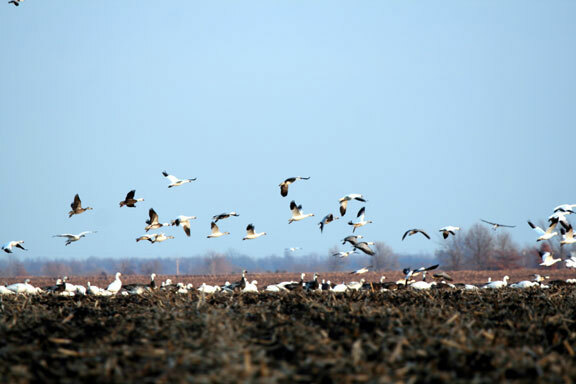 Within NC Kansas, SE Kansas, as well as in NW, NC and SW Missouri Mid-America Hunting Association has enough crop field acreage to place out a field set up suitable for call/decoy refuge flocks. 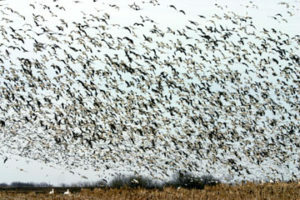 Had a great time in [location deleted] this past weekend [March 11]chasing the snow geese. I am a newcomer to this waterfowl sport. We we overwhelmed with the numbers of birds we saw. Every day we literally saw hundreds of thousands of birds on the move. One huge group was landing across the road as shown in the pics. From what I have read it can be very difficult to hunt these birds, because they don’t decoy down into the spread like canada’s do. As well as the field conditions can be very demanding in setting up your spread. Overcoming all these obstacles and actually getting these birds to try to land in your spread is very exciting. This was our first serious attempt to hunt them, and we did very well in my opinion in taking 49 birds. We had 5 different large groups of birds actually decoy down to within 5 yards and took 6 birds on one pass, two passes of 5, and several 3 packs hitting the ground. For our family this club is a great value in offering multiple outdoor activities in all seasons of the year. See you soon in the turkey woods. Late season unguided goose hunting in one snapshot. This picture is from Mike Sheffer who deer and upland bird hunts. He also has like many of us an enjoyment of wildlife pictures for his and other’s viewing. It is through these type of member reports, our own observations and that of the waterfowl reports on the state conservation web sites that Mid-America Hunting Association waterfowl hunters seeking any goose or duck hunt have an idea of where to begin their scouting effort. A short snap shot into one snow goose hunting trip during the late season. Al and Jon on a cold day. Al hunts in Kansas and Missouri. The last couple of cold spells seemed to concentrate the snow geese in many of our northern regions, but it appears they disperse as the weather warms up, so the hunting has been hit and miss for those willing to brave the challenge. 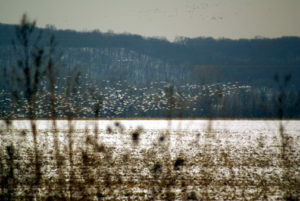 On several recent land runs, we’ve watched some big snow goose flocks working the corn and wheat fields. From a heated vehicle it looks easy, but sitting on the ground for hours in the frigid cold, with 15 to 25 mph wind gusts is brutal. Those snow goose hunters that have prevailed certainly have given good reports. 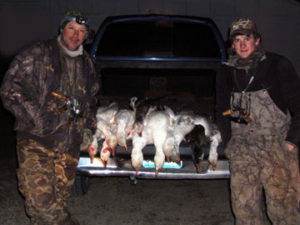 These are photos from a recent snow goose hunt. The last two seasons, Al (first picture on left) has been willing to share his aggressive knowledge of snow goose hunting to the future generation (Jon on right). On both occasions, they were fortunate enough to harvest banded birds and have developed a personal competition comparing the most duck and goose bands. 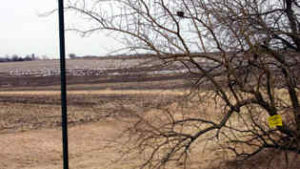 Notice the Mid-America Hunting Association sign, flock of Snow Geese in the field? As an unguided hunting organization many seek to find that particular formula of actions that will lead to success. Many inquire as how they too can be as successful as the hunters seen in pictures. Often we are quizzed at how to conduct self guided snow goose hunts especially by those traveling from out of state. To all the answer is the same. The first is to learn the wildlife, second scout, third is the hunt itself. We provide the private lease land resource the rest is left to the hunter. Otherwise, a hunter should seek a guide service. 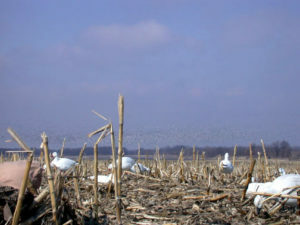 What is a common snow goose hunting technique is to scout to find an area the snow geese are using, setup on one of our crop fields near that area, call and decoy tot he hunter’s skill level. Simple to write and time consuming to put into practice. those snow goose hunters that do have enough recurring success to keep hunting.